Nemo Galapagos Islands Cruises ­ Cruises in Galapagos Islands on board Nemo I, Nemo II and Nemo III cruises. Why only stare at a photo? Do you want to see a new destination? Do you like extraordinary places? Welcome fellow world travelers! Are you teetering on the idea of going on a Galapagos Cruise? Well NEMO GALAPAGOS CRUISES has been the leader in the forum of the Galapagos islands vacation for the past 30 years. This galapagos island cruise is one of a kind, giving the intimate viewpoint of the islands while maintaining the luxury of the yacht. Galapagos Cruises are such a unique choice for exploring the islands. It is really the only option for a Galapagos vacation that allows you to cover everything that the islands have to offer. We offer exemplary accommodations with unrivaled tours, take advantage of this incredible opportunity on a Galapagos cruise. Whether you are traveling solo, with family, on a girl’s trip or as a couple, anytime is a great time to go on a Galapagos Islands vacation. Galapagos cruises are universally known to be trips of a lifetime and a check off on any bucket list. While there are several options to choose from when exploring your Galapagos vacation, the Galapagos Islands cruises surpasses all others since how else can you explore islands other than with a boat. Take a Galapagos Islands cruise and see why this place is named as one of the wonders of the world. When on a Galapagos Islands cruise just leave your worries back home and immerse yourself in the beauty of the islands and cruise galapagos without a care in the world allowing the magic to wash over you. NEMO GALAPAGOS offers a galapagos island cruise that is fully inclusive and makes sure to cover all your needs. We take everyone’s Galapagos Islands vacation extremely seriously, making sure it is very thorough and all encompassing. No one leaves with doubts that their Galapagos Islands cruise was lacking in any way. We put a lot of emphasis in our stellar service. Our team has years of experience and we are there to serve you and cater to your needs, your Galapagos islands vacation is our number one priority. 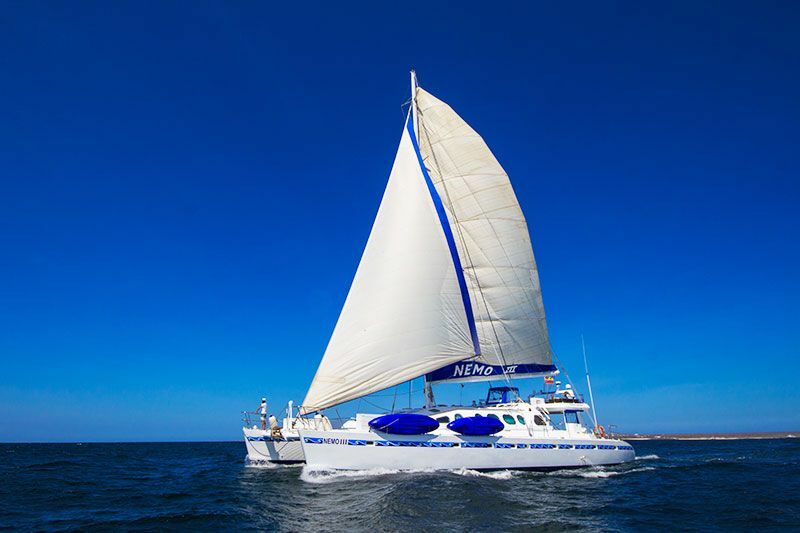 Make sure your Galapagos vacation is stellar and cruise galapagos with NEMO GALAPAGOS CRUISES. We know there are several Galapagos islands cruises to choose from so why is our Galapagos cruise a standout and the one you should choose? NEMO has been in the business of Galapagos cruises for more than 30 years and we take pride in our product that it delivers what is expected and beyond. Take a Galapagos cruise with us and We guarantee you will not be disappointed. We feel that your Galapagos Islands vacation needs to be an experience that you reflect on as being a dream since it was that magnificent. Feel free to compare with other Galapagos cruises, but we are confident in our product and services that you will undoubtedly feel inclined to purchase with us. Please take a look at everything we offer on our Galapagos cruise, you will be pleasantly surprised and we will make every effort to insure this is an everlasting experience that will be remembered fondly for a lifetime. Galapagos cruises have the advantage among all other cruises, which is the location of the islands! Take your Galapagos Islands vacation today and don’t waste another minute. With a length of 24.90 meters and a width of 10 meters, this Catamaran reaches 10 knots and accommodates up to 14 guests in comfortable cabins. NEMO Galapagos cruises are known among the community for having exceptional service and that is portrayed without fail on NEMO I. Your Galapagos Islands vacation will be the best option for traveling the islands. NEMO I is a Galapagos cruise that is thorough and makes sure their clients leave pleased. NEMO I also known as NEMO Martinique takes you on an unforgettable Galapagos cruise through the islands. NEMO I guarantees that your Galapagos Islands vacation goes off without a hitch from day 1. This Galapagos cruise has comfortable accommodations and excellent local recipes that give you a taste of the cuisine of Ecuador. 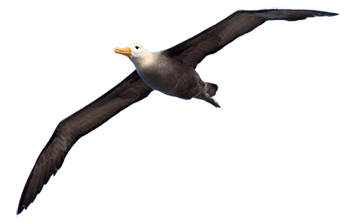 Our friendly captain and crew are all experienced in Galapagos cruises and provide you with the care and attentiveness that you cannot find elsewhere. Have a flawless Galapagos Islands vacation aboard NEMO I. All Galapagos cruises are memorable but with NEMO I you get over 30 years of experience and a record of happy customers. NEMO I takes extreme care of their passengers and aims to insure that your Galapagos cruise is unforgettable. With a length of 21.88 meters and a width of 10.39 meters, this Catamaran reaches 10 knots and accommodates up to 14 guests in comfortable cabins. The majestic NEMO II is a Galapagos cruise that surpasses many with the comfort of fully equipped updated accommodations. This vessel has gone under recent renovations guaranteeing a beyond enjoyable Galapagos islands vacation. When you take into account other Galapagos cruises, you make sure that it satisfies all your needs and fulfills your aspirations for what this Galapagos Islands vacation should accomplish. NEMO II is an excellent Galapagos cruise that island hops and has a detailed itinerary covering all the features that the islands have to offer including the incredible world renowned flora and fauna that should be a part of any Galapagos Islands vacation. Galapagos cruises have the incredible advantage of being able to take passengers to view the exotic animals and plant life with ease from the convenience of a yacht. NEMO II is an intimate Galapagos cruise that takes you up close and personal with wildlife that cannot be found anywhere else in the entire world. Galapagos cruises are a total experience that you will return home remembering how enthralling this treasured vacation was, so choose wisely! With a length of 23 meters and a width of 11.40 meters, this Catamaran reaches 10 knots and accommodates up to 16 guests in comfortable cabins. The luxurious NEMO III will make for an incredible Galapagos Islands vacation. This vessel takes extreme pride in providing the utmost service for their passengers on every Galapagos cruise. NEMO III executes impeccable Galapagos cruises year long and there is never a lull in their immaculate service. NEMO III has up to date features throughout and offers additional perks such as an onboard Jacuzzi on the sundeck making it a deluxe Galapagos Islands vacation. NEMO Galapagos cruises serves 3 meals a day and along with snacks after each excursion. NEMO III Galapagos cruise offers an excellent balance between the comforts of a yacht and an intimate look of the incredible nature on the islands. NEMO Galapagos knows that you want to make sure your Galapagos Islands vacation is the standout against all other trips. With a NEMO Galapagos cruise you will fully understand the hype surrounding these exotic islands. NEMO Galapagos puts the passenger’s needs above everything else. 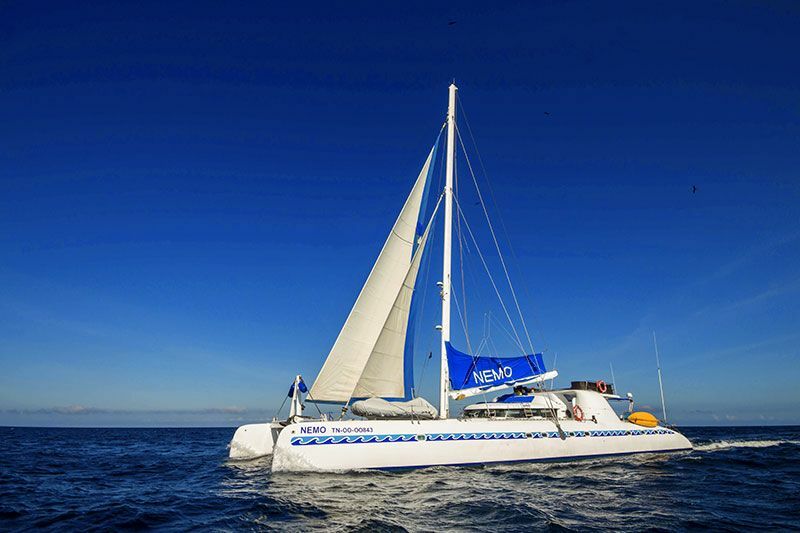 Aboard NEMO III you will experience just that and be confident in your choice amongst the repertoire of Galapagos cruises. Watch our captivating video above to have an intimate look at what our Galapagos cruises have to offer! A Galapagos islands cruise is the only option to explore the islands fully since it provides the flexibility of island hopping within the comfort of upscale accommodations. A Galapagos Islands vacation needs to leave you with that everlasting glow that you just embarked on the trip of a lifetime and a NEMO Galapagos cruise does just that and more. As you saw from our video above, a Galapagos cruise with NEMO allows the ease of travelling through the islands with beautiful panoramic views and comfortable social areas to make long lasting relationships with other passengers aboard. Take an extended galapagos islands tour on one of our amazing vessels and have the ultimate galapagos island vacation. On your daily galapagos islands tour you have the chance to explore on multiple excursions with intimate encounters of the flora and fauna. NEMO Galapagos islands cruise have been perfected for over 30 years making us experts in the field ensuring an outstanding Galapagos Islands vacation. 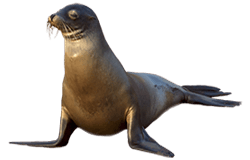 This Galapagos vacation will be unlike any other trip you have experienced and aboard NEMO you will get the added attention from the knowledgeable crew with years of experience in Galapagos cruises. Our friendly crew is available 24/7 for any concerns or any general info you may have about your galapagos island vacation. Each galapagos islands tour that NEMO provides has an experienced Naturalist bilingual tour guide that gives descriptive detail along every excursion. You will have an unimaginable time on the NEMO Galapagos cruise, the captivating landscape that you experience on the sundeck of each vessel is enough to make this Galapagos Islands vacation worth it. Whether you take your Galapagos vacation solo or in a group, you will not be disappointed with what NEMO Galapagos cruises delivers. Your Galapagos islands vacation will be impeccable from day 1, NEMO Galapagos cruises aims to deliver memorable trips. This galapagos island vacation can span from 8-5-4 day trips catering to the needs of their passengers by accommodating to what length they are seeking for a Galapagos cruise. NEMO Galapagos cruise hopes that you elect to have your Galapagos vacation with us since our goal is providing trips of a lifetime to our passengers. A Galapagos islands cruise is unforgettable on its own but finding the provider can be a challenge, NEMO Galapagos exceeds expectations by making sure that you have zero doubts and allows you to only focus your attention on the excitement that lies ahead. This Galalapagos islands vacation is so exceedingly fun that you can only fully comprehend if you have traveled with NEMO, book your Galapagos Islands vacation now and see what all the fuss is about. "I really appreciate all your help in making this dream come true". "We had a wonderful time aboard Nemo 2 for the last 2 weeks. The sights, the crew and guide and the food was fantastic". "We cannot stop talking about our trip and how wonderful it was". Can you imagine walking among gigantic tortoises, sea lions, and exotic birds, all while you are feeling the soothing ocean breeze? You can with a Galapagos islands vacation. Lovers of nature, adventure, and exotic beauty find Ecuador to be an ideal country where you can find different ecosystems and natural wonders, all within a short distance. For this reason, the Galapagos Islands has been awarded as a leading destination and we invite you to take your Galapagos islands vacation with us, Nemo Galapagos / LatinTour. We have amazing Galapagos islands cruises of different lengths of time, all meals included and several excursions per day. What more can you ask for in cruises to Galapagos? Galapagos cruise ships have the chance to take sail in one of the most exotic destinations in the world. Take a look at our recently launched website; it highlights our Galapagos cruises in its entirety. Travel to galapagos islands and see our glorious vessels in person, you will not be disappointed. If you wish to ask for further clarification on what we provide on our galapagos islands cruises, check out our contact information and any member of our team can assist you. NEMO wants to ease any question you may have about Galapagos islands cruises, as experts we are here to serve you. Galapagos island cruises is the start of an epic adventure, do not hesitate further to book with NEMO Galapagos cruises. From the famous zoologist Mark Cawardine, “The Galapagos Islands are probably the most famous wildlife-watching destination in the world. And no wonder - it's almost impossible to exaggerate the sheer spectacle of the place that provided inspiration for Charles Darwin's ground-breaking theory of natural selection”. The islands provide a landscape unlike anything found on this planet. The close encounters you have with the incredible wildlife are uncanny how they are not startled but rather treat tourists as a part of the background. This is such a beautiful place that you get hypnotized by its very unusual surroundings. NEMO Galapagos urges passengers to step out of their comfort zone and fully embrace this vacation to experience what the islands have to offer. Work with NEMO Galapagos sales reps from day one to organize your ideal vacation and cater to your every need. Once embarking on the cruise you are welcomed by our professional crew and living aboard with comfortable accommodations and locally cooked meals with daily excursions that include hiking, snorkeling, traversing unusual terrains and much more. We guarantee that you will not want to leave. We hope that you will be fantasizing of your voyage for years to come. The Galapagos Islands are a dream come true within arm’s reach. Galapagos island cruises are the only option to island hop and get a full experience. You will have several options to choose from in Galapagos cruise ships but NEMO will satisfy all your needs with our years of experience and beautiful vessels that take cruises to galapagos year round. Our Galapagos cruise typically consists of 8 days island hopping with several excursions per day. Here is a snapshot of NEMO Galapagos cruise south itinerary. Day one you travel to galapagos islands and arrive at the airport in Baltra and transferred to the vessel to begin your galapagos island vacation! Beginning the cruise in galapagos to Bachas Beach where passengers are able to enjoy swimming or venture inland for some great wildlife. This galapagos islands cruise provides several options on the excursions to appeal to different interests and athletic ability. Afterwards the galapagos island cruise continues to Santa Cruz. You wake up in Santa Cruz and take a galapagos islands tour to visit a private farm with huge turtles and then off to the famous Charles Darwin Scientific Station, a staple for any galapagos islands vacations. Afterwards, you cruise galapagos at night towards San Cristobal. On San Cristobal the excitement of your Galapagos islands vacation continues with an excursion on Cerro Brujo with a beautiful white sand beach and great exotic animals accompanying you along the shore. The galapagos islands cruise goes to kicker rock and lobos island where you get up close to all the sea lions. The galapagos island cruise navigates to Española the following day. As the vessel cruises in Galapagos you wake in Española and have a galapagos islands tour to Punta Suarez and Gardner Bay and explore with a multitude of encounters with the flora and fauna. The galapagos island cruises ends the day in Gardner and Osborn islet for snorkeling, a highlight for your galapagos vacation! At night you travel to galapagos islands of Floreana. Once the galapagos cruise arrives you disembark to post office bay, the beaches of cormorant point which have contrasting features one with green sand and the other with white, a unique portion of your Galapagos islands vacation. At night it is time cruise galapagos towards Sante Fe. On day 6, your galapagos cruise begins on Sante Fe Island, home to one of the most beautiful coves. Then you cruise to galapagos South Plazas where you encounter the largest populations of land inguana on your Galapagos islands vacation. During the evening your galapagos islands cruise heads towards Chinese Hat, a tiny island just off the southeast tip of Santiago home to sea lions and light foot crabs. Then most passengers to add some excitement to their Galapagos vacation you have the option to snorkel in the waters near China Hat where white-tipped sharks are commonly found. In the afternoon your Galapagos island cruise heads toward Bartolome, which is the most photographed and popular island on your Galapagos islands vacation. The Pinnacle Rock feature is well known among many going on a Galapagos islands tour since it has unusual lava formations. The snorkeling here is also a spectacular part of your Galapagos islands vacation because you have the chance to swim with fish, sea lions and penguins. Finish the day with your last sunset dinner and an early morning cruise to galapagos to your final spot at Caleta. The last excursion of your Galapagos islands vacation on Caleta gives you a chance to see more turtles, sharks and rays. Your amazing Galapagos vacation now ends and you disembark in Baltra and transferred to the airport to head home bringing with you all the treasured memories of your Galapagos cruise. To fully understand what NEMO Galapagos Cruises offers you need to envision both sides of the itinerary. Both provide spectacular Galapagos islands vacations but take you on different voyages that are each special on their own. The North Galapagos cruise starts the same arriving in Baltra and getting transferred to the yacht to begin your cruise to galapagos and your first stop is Seymour! Here your galapagos vacation starts with passing colonies of Blue Foot Boobies and other exotic birds. That evening you set sail towards Santa Cruz and venture around the private farm “las primicias” and in the afternoon you visit the Charles Darwin Scientific station and you get the chance to see the huge tortoises, a highlight on anyone’s Galapagos Islands vacation. The Galapagos islands cruise continues that evening to Isabela. Once arrived at Isabela your Galapagos island cruise starts at Punta Moreno, a colorful part to any galapagos islands tour. You traverse through black lava rock where tide pools have formed surrounded by mangroves, and beautiful lagoons that attract all sorts of wildlife. You head to snorkel and set sail towards Urbina Bay. Urbina bay is a staple on most Galapagos islands cruises having the most recent example of geological uplift in the Galapagos and provides a nesting area for most wildlife. In the evening your Galapagos cruise heads to Tagus. Tagus cove is well protected surrounded by two volcanic craters. The galapagos islands tour provides excellent views of Darwin lake and different vegetation zones. Afterwards, your Galapagos island cruise hears toward Fernandina Punta Espinosa. In this part of your Galapagos islands vacation you visit the youngest and most active volcano that erupts every few years. The Galapagos cruise continues onto day five heading to Santiago. Today’s Galapagos Islands tour starts with Puerto Egas, where visitors have a chance to see a variety of shore birds, marine iguanas, and sea lions. There is a walk that reaches a crater rim that has an incredible view and just beyond the trail continues to a fur seal grotto and they can be seen just playfully swimming and relaxing and you get to join them! A great highlight on many Galapagos islands vacations. Later you head to Espumilla beach where the bird watching is unlike any other spot on your galapagos island vacation. You end the day taking your Galapagos islands cruise towards Buccaneer’s cove, a safe haven for pirates. You head back to the vessel and continue your Galapagos cruise to Rabida and Sullivan Bay. Here your Galapagos vacation heads to Rabida Island and Sullivan Bay witnessing the remarkable red color from the oxidized iron in the lava and you have opportunity to see the 9 different varieties of finches. At night your Galapagos cruise navigates toward Genovesa. In Genovesa, the galapagos islands tour begins in El Barranco where you have a demanding hike up a steep cliff and nesting seabirds can be found. Then at Darwin Bay the Galapagos vacation continues with a trail in a collapsed volcano with amazing wildlife, a great photo opp to capture a unique part of your Galapagos cruise. This is the last night on your Galapagos island cruise, you have a sunset dinner and travel to galapagos islands final spot, Daphne Island where you sail the circumference and get your last encounters with the wildlife. You have breakfast and head to airport to cap off a fantastic galapagos island vacation. Hopefully, through capturing the itineraries you have been able to envision what our Galapagos cruises entail. NEMO Galapagos cruises puts a lot of pride and care in their product, making sure that our passengers have an unforgettable galapagos island vacation. There are several cruises in Galapagos, why should you choose NEMO Galapagos cruises? To travel to galapagos islands is a feat on its own so you must decide carefully. The Galapagos island cruises each provide something different but what NEMO Galapagos cruises carries above others is over 30 years of experience perfecting their product. We are a local company that puts the utmost emphasis in your Galapagos vacation. The team and crew offer a friendly professional service that is apparent on every Galapagos islands cruises. Each Galapagos cruise has several excursions each day with three catered meals and snacks. The accommodations have been renovated in 2016 adding that extra layer of comfort to your Galapagos vacation. Galapagos cruise ships come in all shapes and sizes but NEMO Galapagos cruises vessels has the advantage of being personalized with the luxurious convenience of a yacht. You won’t be lost in the crowd of passengers since some galapagos cruise ships hold hundreds of passengers you don’t get the extra attention from the crew as you do on NEMO Galapagos cruises. NEMO Galapagos cruises adds an extra finesse that insures an unforgettable Galapagos islands vacation. 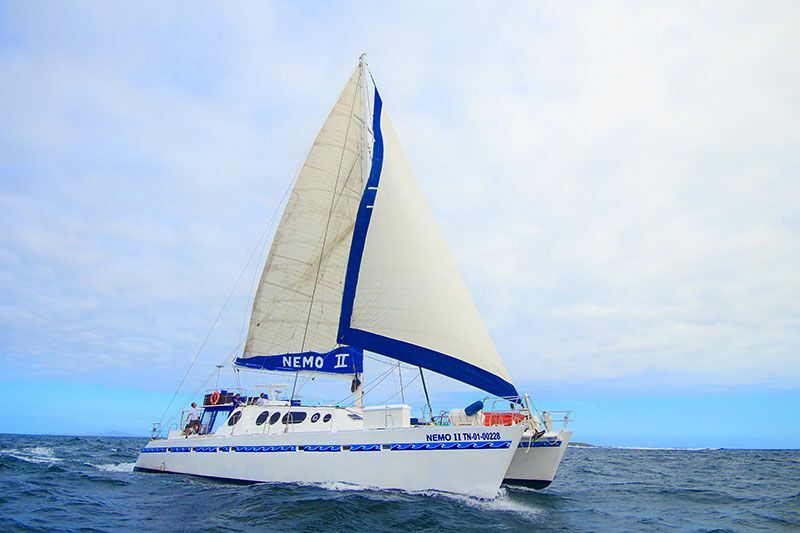 We are the owners of the NEMO FLEET that conduct galapagos island cruises year long. NEMO Galapagos cruises has three decades of experience, we know what you are seeking in your Galapagos islands vacation and aim to satisfy all the aspirations you may have for this Galapagos cruise. Cruises to galapagos are spectacular and fun for anyone to embark on for the adventure of a lifetime. There is a variety of Galapagos cruise ships to choose from and the chance to take a Galapagos islands vacation with a NEMO Galapagos cruise will have lasting effects for the rest of your life. The stigma surrounding a Galapagos islands vacation is nothing but positive and taking a Galapagos cruise is the epitome to get the full experience. To fully capture the essence of a Galapagos islands vacation one must take a Galapagos islands cruise with NEMO, as described above we have itineraries that does not miss any aspect that the islands offer.